Required Holiday Reading: "The Yattering and Jack"
The Holiday Season is upon us. Arguably, the Holiday Season is all about fighting demons. For this reason, Clive Barker's "The Yattering and Jack," first published in Books of Blood, Volume One is a most appropriate read for the season. The Yattering is a minor demon that was sent to haunt Jack Polo (a gherkin importer), because Jack's mother defaulted on a deal with the demon Beelzebub. Jack's mother recanted on her nefarious deal to deliver her soul, along with Jack's, and died in the arms of a priest. By doing so, Jack's mother ensured that her soul would go to heaven, and incurred the wrath of Satan's minions upon her son. Barker is normally very feminist in his writing, his female characters often have agency and are not always conventionally attractive. That being said, in "The Yattering and Jack," Barker relies on the trope that it is the betrayal of a woman (in this case, Jack's mother) that causes the main male character misfortune. The Yattering's sole goal is to drive Jack into self-disgust, self-rejection, before falling into madness. Once the victim (in this case, Jack) has fallen into despair, moral reserves would run out, leading the victim down the path of eternal damnation. When the novel opens, the invisible Yattering is becoming increasingly frustrated at their predicament, because Jack simply will not crack. Every action the Yattering throws at Jack in an attempt to drive him into madness is met with goodwill, and an inherent obliviousness. Jack, in the response to the supernatural horrors that occur around him, simply sighs and says: "Che sara, sara." "In the bathroom, the Yattering would have squeezed toothpaste around the toilet seat and have plugged up the shower-head with soggy toilet-paper. It would even share the shower with Jack, hanging unseen from the rail that held up the shower curtain and murmuring obscene suggestions in his ear. That was always successful, the demons were taught at the Academy...Except for some reason this rule did not apply to Polo; he was unperturbable: a tower of propriety. " The Yattering, being a minor demon, must also follow certain rules. These rules were drilled into the Yattering at the demon Academy, and would have dire consequences if broken. One rule is that the Yattering cannot leave the confines Jack Polo's house. Another rule is that the Yattering cannot touch Jack directly. Throughout the story, the Yattering gets more and more frustrated at Jack's nescience to it's attempts to claim his soul for the Lord of Darkness. "It was deeply embarrassing, and it was gradually destroying the demon's self-confidence, seeing this bland victim survive every trail and trick attempted upon him. In a fit of uncontrollable anguish, it boiled the water in the aquarium, poaching the guppies. Polo heard nothing. Saw nothing." The Yattering sits and seethes throughout summer and autumn, knowing that the best opportunity to break Jack is quickly approaching. "It was approaching Christ's Mass, and Jack's children would be coming home to the bosom of the family. Perhaps they could convince him that all was not well with the world; perhaps they could get their fingernails under his flawless indifference, and begin to break him down. Hoping against hope, the Yattering sat out the weeks to late December, planning its attack with all the imaginative malice it could muster." Jack is preparing for the holiday as well. Jack fastidiously cleans his daughter's rooms, and sets up a Christmas tree in his lounge. Jack is also aware of the insidious presence in his home. Jack is purposely ignoring the demon to irritate the Yattering, while maintaining his own sanity. "Once in a whole, as he went about the preparations, Jack thought of the game he was playing, and quietly calculated the odds against him. In the days to come he would have to measure not only his own suffering, but that of his daughters, against the possible victory. As always, when he made these calculations, the chance of victory seemed to outweigh the risk." On the 23rd of December, Jack's daughters, Amanda and Gina, arrive home. Barker sticks to his feminist leanings when describing Amanda and Gina. Barker uses adjectives not at all related to their looks, in lieu of that, Barker describes their characters. Amanda is opinionated and strong. Gina is poised and perspective. Gina and Amanda are not shrinking violets, hopelessly relying on their father to protect and save them. In fact, even the Yattering describes the women as looking "dangerous." The Yattering immediately begins to wreck havoc on the newly arrived Gina and Amanda, hiding beneath their beds and tossing them out of them. Jack's girls are understandably concerned. Jack says that nothing strange is afoot. On Christmas morning, when Jack's daughters insist that something fiendish is about in the house, Jack scoffs at them, saying that Christmas will not be spoiled talking about gremlins. The entire family then laughs, and they go off to to begin their Christmas celebrations. This causes the Yattering to be vexed. "Gremlins. That surely bit deep. To call the Hell-spawn a gremlin. The Yattering, weak with frustration, acid tears boiling on its intangible cheeks, ground its teeth and kept its peace. There would be time yet to beat the atheistic smile off Jack Polo's smooth, fat face. Time aplenty. No half-measures from now on. No subtlety. Time aplenty. No half-measures from now on. No subtlety. It should be an all-out attack. Let there be blood. Let there be agony. "I don't know what it was." Amanda and Gina insist that there is something going on, and want to call the police or an exorcist. Jack says that they will call neither, reiterating that nothing strange at all is occurring. Gina and Amanda notice that Jack's eyes betray what his mouth will not utter; that there is a complete war going on within the house, among forces that Gina and Amanda do not completely understand. "Without warning the tree gave way to the dictates of centrifugal force, and exploded." Other objects begin to explode as well. Porcelain figurines, vases, the television, all send fragments of their innards sailing across the room. Jack slowly edges his way towards the back door, where Gina and Amanda lay crouched and waiting for him. The proverbial Armageddon that had been occurring in the Lounge had ceased. The Yattering's rich laughter is heard coming from the lounge, cutting through the Christmas night like an Angelus bell. Seemingly unperturbed, Jack declares that his is going for a walk and heads towards the front door. "No," thinks the Yattering. "No, no, no." Every time Jack begins to unlock the bolt of the front door, the Yattering bolts it. Jack tricks the Yattering by running to the back door, before changing direction half way and heading back towards the front door. Gina, wise to her father's strategy, unbolted the front door while the Yattering was distracted. Jack succeeds in outmaneuvering the Yattering, and walks into the night. The Yattering is furious. In the midst of it's wrath, the Yattering commits an unpardonable transgression. The Yattering crosses the threshold of the home and touches Jack, planning to crush it's skull. Touching human flesh is agonizing to the Yattering, and somewhere in Hell, the powers felt the sin, and knew that the war for Jack's soul was lost. Because of those sins, the Yattering is made visible. The Yattering, remembering their lessons from the demon Academy, knows that it is now bound to serve Jack. When the Yattering speaks, the reader and Jack discover that the Yattering's voice has an Australian lilt. This is perhaps a nod to the fact that the Yattering's original home is "down under." Way down under. Jack is different from other humans that have enslaved demons. Other humans in Jack's situation have asked for miracles, for women with the beauty of Helen, or to fly. Jack, however, is a man of simple tastes. Jack simply desires the love of his children, a pleasant home, and a good trading price for gherkins. In lieu of glory, or women, or flight, Jack simply asks the Yattering to tidy up his home. "The Yattering and Jack" is a phenomenal read. To some, the holiday season is equivalent to battling a demon, so they will find solidarity in Jack's conflict with the Yattering. 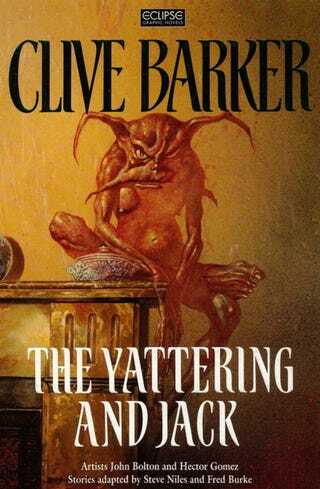 "The Yattering and Jack" also differs from much of Barker's early works, as the short story is brazenly funny. For these reasons, this holiday season, if you're faced with a relative that is trying your patience, abscond from the room and curl up with a copy of "The Yattering and Jack."